Sunday’s World Cup Round of 16 action kicks off with hosts Russia taking on Spain, followed by Croatia-Denmark. Here’s a breakdown of the market for both matches and which sides the sharps/public are betting. Spain opened -157 to win in regulation and have moved both up (-170) and down (-148) over the last few days. 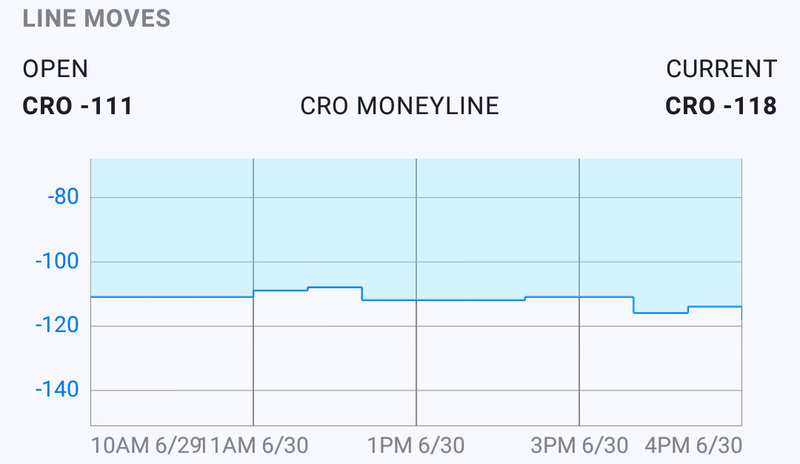 Most of the market currently lists them at -160 and they’ve attracted 70% of all moneyline tickets. Spain are also a very popular bet on the spread of -1 (+110) with nearly 80% of bets. Even with home-field advantage, Russia aren’t getting much love to pull off the upset. Sharper money hasn’t really weight in on this matchup yet. The total opened at 2.5 (u-150) and most of the action has been on the over, dropping the juice down to -116. Will Goals Be Easy to Come By In Spain vs. Russia? Spain have an implied probability of ~78% to advance to the quarterfinal, Russia 22%. Croatia won all three of their group matches (Nigeria, Argentina, Iceland) and more than 80% of bettors believe they’ll extend that streak to four against Denmark. Since odds opened, Croatia have moved from -111 to -118, and there’s a great chance that’ll increase at some point. Just 13% of tickets has come in on Denmark (+444) for the outright upset, and 7% on the draw (+243) which would send the match to extra time. The low total of 2 goals means public bettors are back on the over, and that’s no surprise given Saturday’s ten-goal eruption from Argentina-France and Uruguay-Portgual. Both those totals were listed at just 2 goals as well. Croatia has a ~54% chance of winning in regulation but ~70% probability of advancing to the quarterfinal.